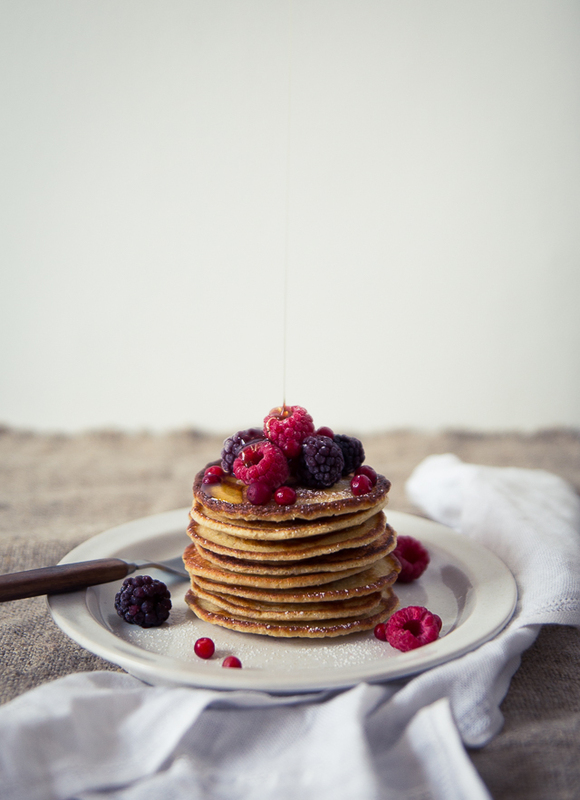 I can’t believe I haven’t written more about breakfast in the history of this blog. Suffice to say I. love. breakfast. But of course, I like to feel healthy in my body and stay away from colds etc. so food is truly my medicine. For having made this granola so many times, I’m almost embarrassed to say how insecure I feel about the measurements. I don’t understand how hard it can be to just use a measuring cup and write down how much of each thing I’m using?? No, I always have to add ”just a little bit more” or ”a dash of” this and that *sigh*. I never.learn. It’s like the cooking is in my body and not my mind. I sort of feel how I use to do it, but I can’t describe it. Anyway this recipe is no rocket science. It’s not like we’re making french macarons. 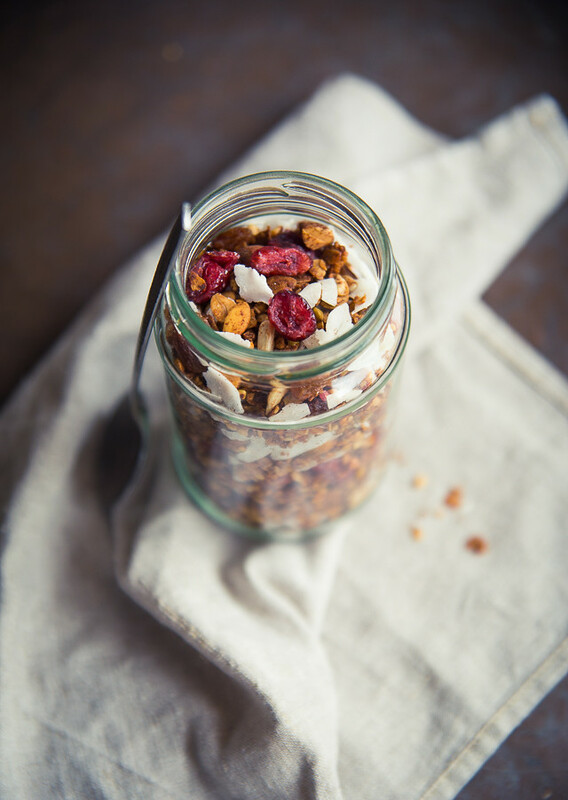 I always have a batch of this granola ready to eat with oat or almond milk, oatmeal, chia pudding, smoothies or sometimes even on top of salads for a little crunch. Sometimes I make a double batch of the dry ingredients and store half of it in a glass jar ready to be mixed with coconut oil and honey and toasted in the oven at a later time. 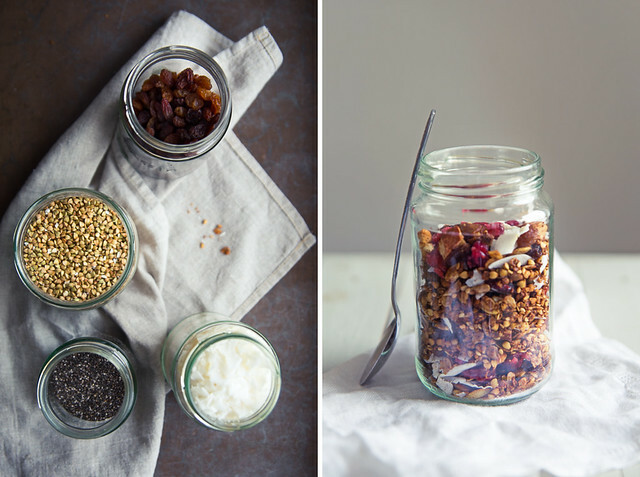 You can add whatever nuts, seeds and dried fruit you prefer. This time I just took what I happened to have at home. The whole buckwheat gives the granola an amazing crunchiness, and the sesame seeds is my secret ingredient! 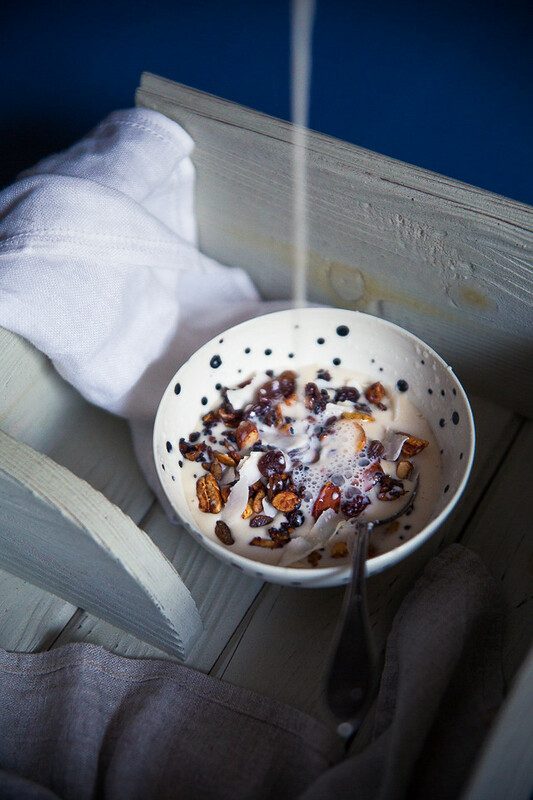 Their rich flavor when toasted brings this granola to another level <3 Besides from that, it’s the usual stuff. Oats, coconut, raisins, nuts, etc. Side note: my apartment always smells like this granola. This recipe can easily be made vegan by switching honey for agave syrup (use a little less than what the recipe calls for), or gluten-free by using gluten-free oats. 1. Heat oven to 175’C / 345’F. 2. Coarsely chop nuts. 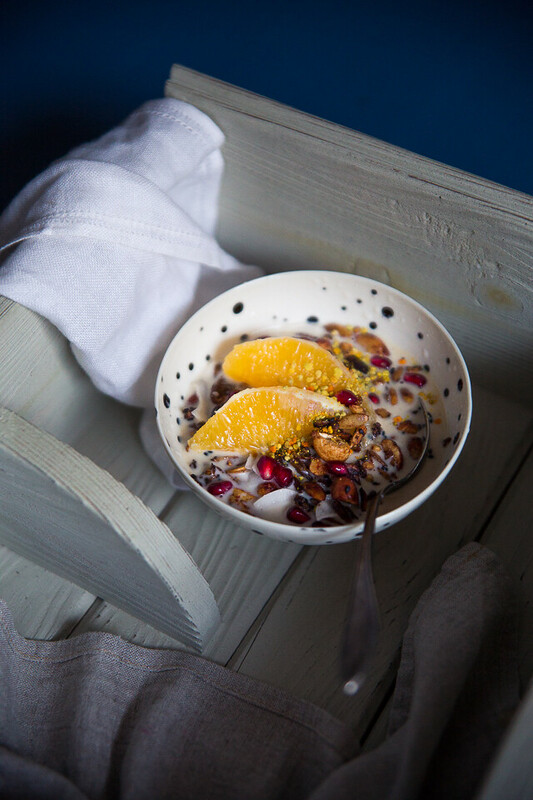 Combine together with the rest of the dry ingredients (except dried fruit, coconut, chia and hemp seeds) and spices in a bowl. Carefully heat coconut oil and honey in a sauce pan until runny. Pour over the dry mixture and stir until well combined. If it feels too dry, take a little more coconut oil. The granola should be all covered and sticky. 3. Pour mixture onto a baking tray or ramekin covered in parchment paper. Spread out. Bake in the middle of the oven for around 30-40 minutes, folding it every 10th minute or so. The time will vary depending on your oven! Mine is, as I’ve pointed out before, a slow and crappy gas oven, so the granola might be ready much faster for you! Keep a close look out so you don’t burn the granola. It should be golden when done. Don’t worry if it’s still sticky. It will dry once cooled. 4. Let cool completely before adding dried fruits, coconut etc. Store in glass jar in room temperature. Lasts for a week. Enjoy! Psst! 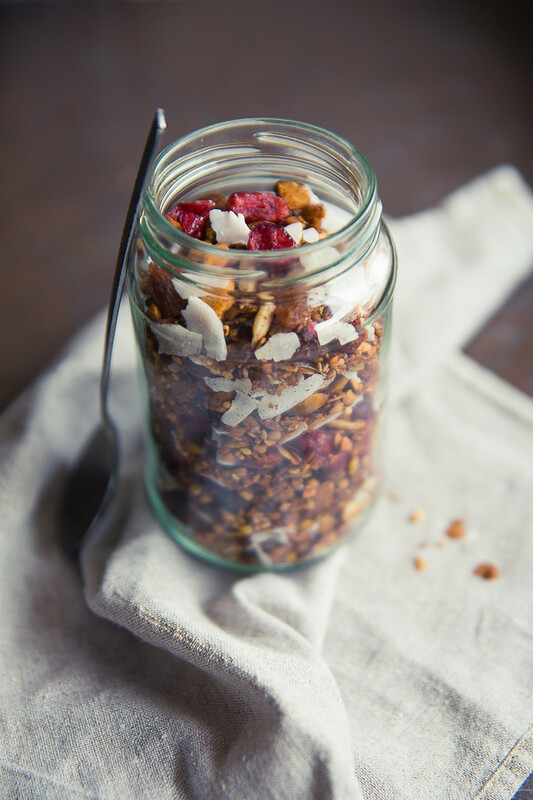 If in a hurry (for example in the morning right before breakfast), try making instant granola in a skillet instead! I do this more often than I want to admit… Halve the recipe and stir-fry on medium low heat until crispy and golden. It is a lovely and therapeutic morning task, I can tell you.